Having grown up on the eastern side of our country, I was never exposed to underground sprinkler systems...they were simply unnecessary given the moist climate. 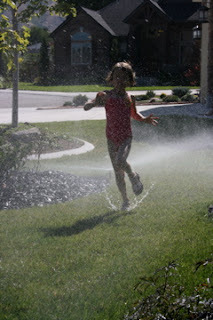 If I wanted to run through the sprinkler with my sisters, a parent would just attach the sprinkler component to the garden hose and we would run and scream to our hearts' content. My favorite type was the rotating sprinkler shaped like a fan. But now that I live in SLC, where all is dry, grass doesn't really survive without a permanent sprinkler system underground. 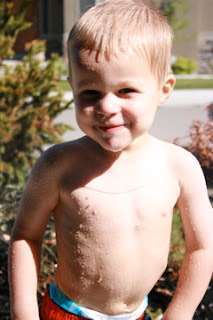 This makes my life as a parent easy when it comes to outdoor water fun. All I have to do is hit one little button and voila, my yard is transformed into a misty oasis. It's almost as good as the fountain at the Gateway. Woah - Lukie is buffed! :) They sure make it look like a lot of fun.